BIG SALE!! GEMSTONE ANGELS BIG SALE!! 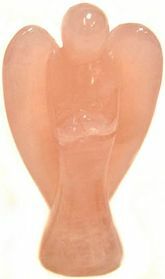 Hand carved and polished extra Clear Madagascar Crystal Quartz carvings of praying Winged Angel. Quartz is known as a healing crystal that magnifies the life force or Chi energy, which clears negativity and past wounds and refreshes the mind, emotions and physical body. Angels are universal symbols of divine guidance and protection. Beautiful Citrine Angel carvings from India have translucent yellow and milky quartz hues. Citrine quartz cannot hold negative energy, but transmutes and dissipates it. In Feng Shui lore Citrine is the stone of the entrepreneur, placing a crystal in one's store or office is said to increase good fortune and assists in acquiring and maintaining wealth. Chinese Jadeite carvings of praying Winged Angel in the precious translucent Pale Jade apple green hues. One of the most auspicious stones in Chinese culture, Jade has been treasured as a "Bringer of Good Fortune" for centuries. Jade is an excellent wealth stone, place it in your wealth bowl and position in the prosperity corner. Angels are universal symbols of divine guidance and protection. 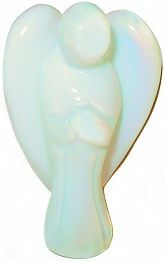 Popular Opalite Angel carving shimmers with rainbow colors like Opal. Opalite is a man made material made of Fiber Optic Calcite and can be used as a Feng Shui tool to clear negative energy in dark rooms and corners. 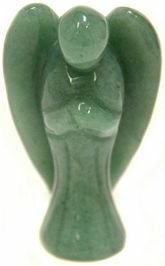 Deep Green Quartz Winged Angel carvings pray in full length robes with wings folded. Green Quartz acts to inspire creativity and to attract success, prosperity and abundance. Angels are universal symbols of divine guidance and protection. India Chevron Amethyst Angel carvings have dark Amethyst crystals intermingled with veins of milky quartz in unique chevron patterns. In gemstone lore Chevron or Dogtooth Amethyst is considered a powerful and essential tool for awakening and energizing the third eye and cleansing the Aura and chakras. Hand carved and polished Dumortierite Angels are an excellent meditation tool. Dumortierite, named after it's discoverer, is used to ground high strung temperaments, it softens stubbornness while increasing self reliance and is considered a stone of patience by crystal masters and healers. Rainbow Fluorite Angel carvings have translucent purple, blue and clear banding. Named for the Latin verb 'fluere' meaning 'to flow', Fluorite has a cleansing, fluid quality used by crystal masters to clear both physical and mental energies which aids regeneration and clarity of thought. 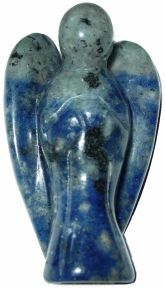 Rare Angel carvings in Lapis Lazuli with deep blue coloring. Lapis Lazuli was the revered stone of Ancient Egyptian King-Priests and Queen-Priestesses. It was said to exist before time was born and admit one to the sacred mysteries. Hard to find hand crafted Lepidolite Angel carvings in soothing violet and purple hues. Lepidolite is said to have a refreshing energy of lightness, hope and acceptance. As a healing stone Lepidolite has been used to ease stress and stabilize mood swings. 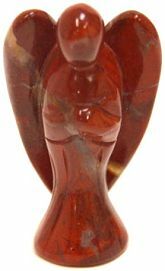 Bold Red Jasper Angel carvings have dramatic brick red hues. In ancient scriptures, Red Jasper is a stone of justice, assisting to rectify unjust circumstances and is often used for protection. 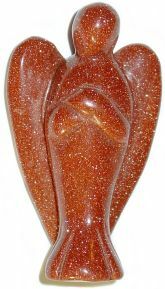 Luminescent carvings of praying Winged Angels in chatoyant orange Sunstone! In Crystal Lore Sunstone is used to increase vitality and alleviate stress. The Ancient Greeks believed Sunstone represented the Sun god and brought life and prosperity to it's possessor as well as good luck in games of chance. 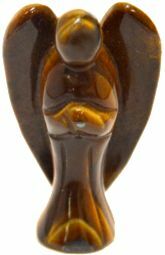 Radiant hand carved Angels in superb quality Gold Tiger Eye are a pleasure to behold. In crystal lore Tiger Eye melds the vibrations of Sand and Sunlight, synthesizing the energies of Sun and Earth, which energize the body and focuses the will to fulfilling heartfelt dreams. Lovely Green Aventurine Winged Angel carvings have full length folded wings. Crystal masters use Aventurine to foster integration of the emotions, enhance creativity, clarity and augment the pioneering spirit. It is known as a powerful healing stone. Angels are universal symbols of divine guidance and protection. Brilliant red Goldstone Winged Angel carvings have full length folded wings. Beautiful deep Red Goldstone dazzles the eye as the light bounces off the thousands of golden sparkles hidden within. Angels are universal symbols of divine guidance and protection. 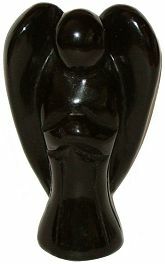 Black Obsidian Winged Angel carvings pray in full length robes with wings folded. The power stone Black Obsidian has been used to banish grief and encourage happiness and good fortune. Angels are universal symbols of divine guidance and protection. Unusual Opalite Angel carving shimmers with rainbow colors like Opal. Opalite is a man made material made of Fiber Optic Calcite and can be used as a Feng Shui tool to clear negative energy in dark rooms and corners. 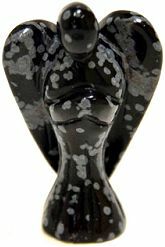 Dramatic Snowflake Obsidian Winged Angel carvings have full length folded wings. Obsidian takes on Snowflakes when a white mineral Phenocryst is present. It is a stone of purity, bringing balance to body, mind and soul. Angels are universal symbols of divine guidance and protection. Dramatic Red Jasper Angel carving is exquisitely hand carved on both sides with full length folded wings. These carvings have rich brick red hues with some open geode crystals and milky quartz. Red Jasper is believed to be a stone of justice, assisting to rectify unjust circumstances and is often used for protection. Red Jasper belongs to the quartz family known as Chalcedony. Hard to find Blue Sodalite Angel carvings are exquisitely hand carved on both sides. Brazil Sodalite has a high polish and complex White Calcite markings. Sodalite promotes companionship and self-esteem, it is a beautiful stone similar to Lapis Lazuli and often used for jewelry. Angels are universal symbols of divine guidance and protection. Translucent Madagascar Rose Quartz Winged Angel carvings have full length folded wings and pray in long sleeve robes. Rose Quartz has a soothing, calming effect and is the traditional lover's stone, giving rest to restless hearts. Angels are universal symbols of divine guidance and protection. New hand carved Angels in fiery Tiger Eye! Polished Tiger Eye is so magnetic with it's rich chatoyancy and deep vibrant colors. This stone melds the vibrations of Sand and Sunlight, synthesizing the energies of Sun and Earth, which energize the body and focuses the will to fulfilling heartfelt dreams.